Sweden’s national public broadcaster Sveriges Television (SVT) has implemented a remote IP production set-up for coverage of the FIS Alpine World Ski Championships (4-17 February) in Åre. The broadcasting operation for the event includes the largest number of cameras ever deployed and the highest volume of remote signals – video, audio and data – transmitted to date from a live location to SVT’s headquarters in Stockholm, over 600km away. SVT partnered with Net Insight and Grass Valley on the production. Five years in the making, the project has broken new ground in remote production, the companies claimed. Altogether, 80 LDX 86 series cameras from Grass Valley, located along the ski course in Åre, are delivering uncompressed HD signals over two 100Gbps fibre circuits from Telia, to three control rooms at SVT’s Stockholm facility. Each circuit uses Nimbra transport solutions from Net Insight, including the recently launched terabit capacity platform, the Nimbra 1060 Terabit Capacity Platform. In parallel, other HD video and all JPEG2000 compressed video, as well as intercom, audio and data, and return signals are transported with Net Insight’s Nimbra transport solutions, including the recently launched Nimbra 1060 Terabit Capacity Platform. The transport runs over double 100 Gbps fibre circuits to three control rooms at SVT’s Stockholm facility. Grass Valley’s unique DirectIP capability is central to this workflow, enabling the XCU base stations to be situated in the central equipment room in Stockholm, while the cameras are in the snowy hills of Åre. DirectIP simplifies the interconnections that need to be made, allowing all the camera signals to connect straight into the XCU. This also enables the shaders to match the cameras, without any delay, with fewer people traveling and in a comfortable environment in Stockholm. “This accomplishment demonstrates how far we’ve come in executing remote productions, especially looking back at our remote setup in 2012 for the London Summer Games,” said Adde Grandberg, director of technology, CTO, at SVT. 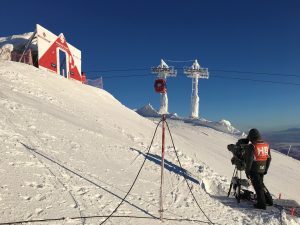 “To achieve this feat for the Alpine World Ski Championships, we knew from the beginning that we’d need more bandwidth, an adaptable workflow and very tight collaboration with Net Insight and Grass Valley, with no compromise to our ability to deliver high quality, synchronised images to our rights holders. The stunning pictures they deliver, with minimal latency, made Grass Valley’s cameras the brand of choice for us and this project. The remote production workflow is set up to support a team of around 150 camera operators and technicians on location in Åre, with the rest of the production workflow and staff in Stockholm. The DirectIP configuration on the Grass Valley cameras enables highly efficient handling of uncompressed HD signal distribution. “When SVT first approached us about this project, the capacity to support so many cameras and reliably transport uncompressed HD signals over IP across such a large distance was unprecedented. We were working with Grass Valley at the time on this very undertaking, so this synchronicity significantly helped us bring this Alpine Ski undertaking to fruition for SVT,” added Larissa Görner, strategic product manager at Net Insight. “Our customers are continuously raising the bar and rewriting the rules for what’s possible with live production. Remote production is the next step change, opening up new ways of working by allowing a production team back at base to have all the resources they need to deliver high quality, captivating content,” said Mark Hilton, vice president, live production at Grass Valley. “We’re very honoured to work with SVT and Grass Valley on this prestigious live event and we are also happy to support Swiss broadcaster SRG SSR and German broadcaster ZDF during their remote production of the Alpine World Ski Championships,” added Henrik Sund, CEO at Net Insight.